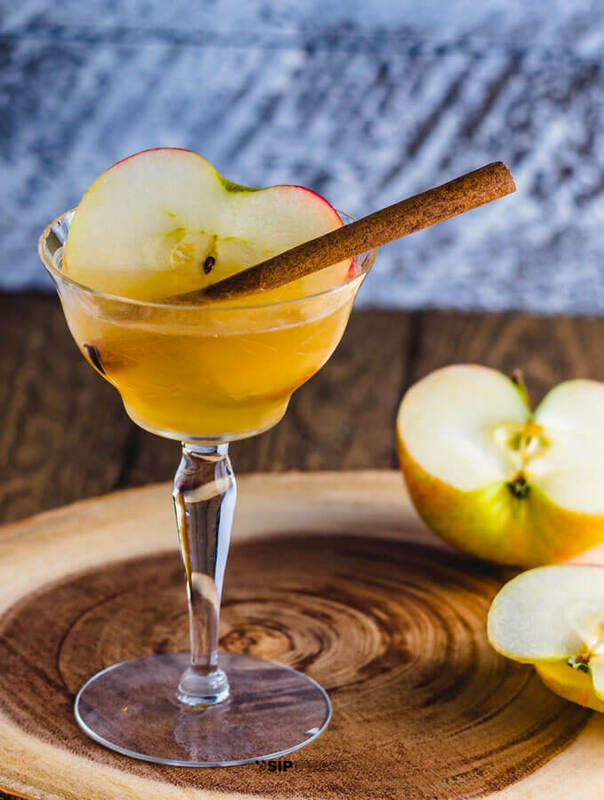 This bourbon apple cider cocktail with maple syrup is the perfect Autumn cocktail. 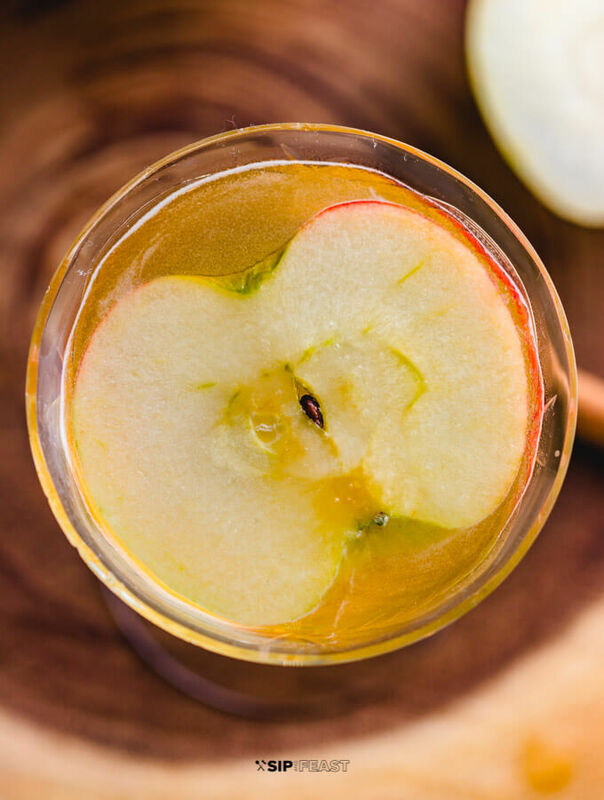 The sweetness from the apple cider is the perfect match to the bourbon. And really, how bad can a cocktail with maple syrup actually be? 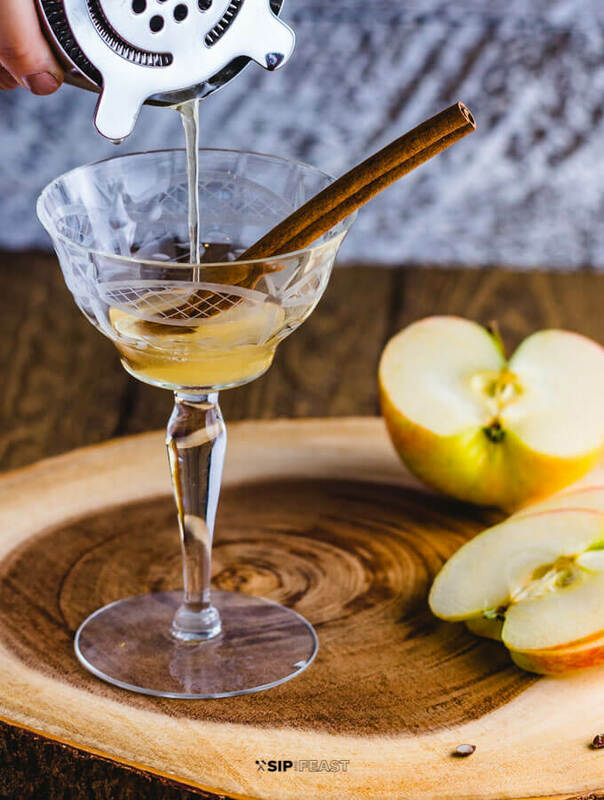 This Autumn inspired apple cider cocktail with maple syrup and bourbon is delicious and is a great way to cap off a day spent picking apples or pumpkins, or a perfect pre-dinner cocktail to serve at a Fall gathering. Either way, it’s sure to be a delightful drink recipe to add to your collection. 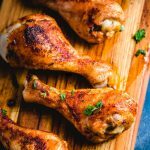 It’s super simple and can be made in less than 10 minutes. 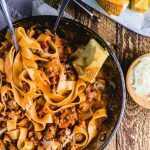 You’re looking to get rid of the overabundance of apple cider you purchased from your local orchard, farm stand or grocery store. You want to try a bourbon based drink but aren’t quite ready for straight bourbon. 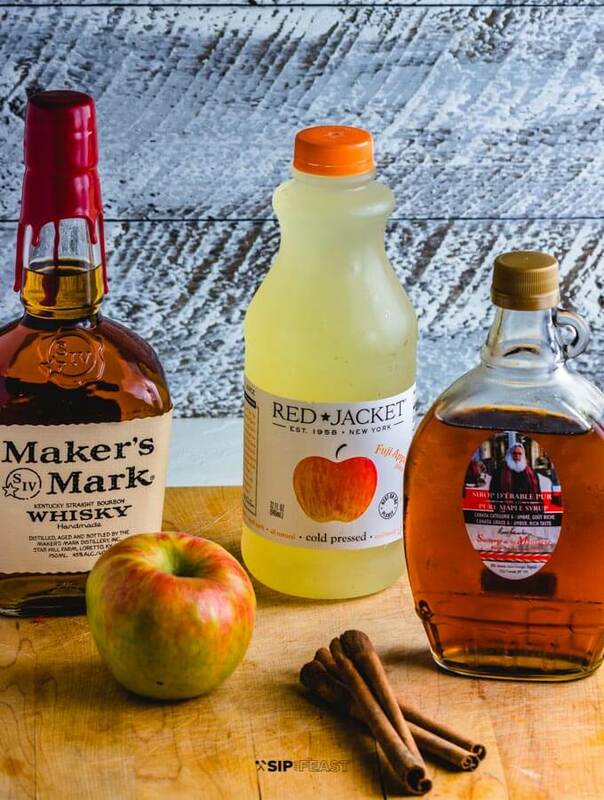 You love straight bourbon but you’re feeling festive and want to celebrate Fall, dammit! 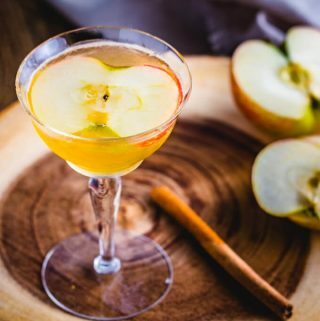 Apple cider is great, hard cider is better, but cider cocktails are the bees knees. My main reason or inspiration to make this drink was actually the maple syrup. A very dear friend recently visited a sugar shack near Montreal and brought back a bottle of the most incredible maple syrup. We’ve used it in a few recipes so far, like our butternut squash soup, but I really wanted to use it in a cocktail. And I’m so glad I did. It was the perfect compliment to the bourbon and apple cider. As I’ve stated before, this drink is so simple and only requires a few ingredients. 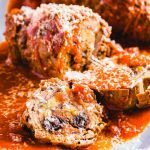 As with many of our other recipes, when only a few items are needed, you want to make sure you are using the best quality ingredients. Please don’t go using some Aunt Jemima or any other corn based syrups to make this drink. 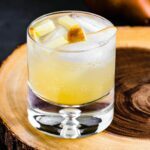 Since maple syrup was the inspiration for this apple cider cocktail, I’ll talk about that first. The syrup I used is from Sucrerie de la Montagne. When I smell this syrup, I can envision myself in a shack in the woods surrounded by tapped maples. It is heavenly. If you can’t get your hands on this syrup, any good quality maple syrup will do. I also love Trader Joe’s bourbon maple syrup. 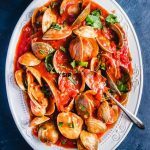 It’s usually released in the Fall and is made in limited batches. 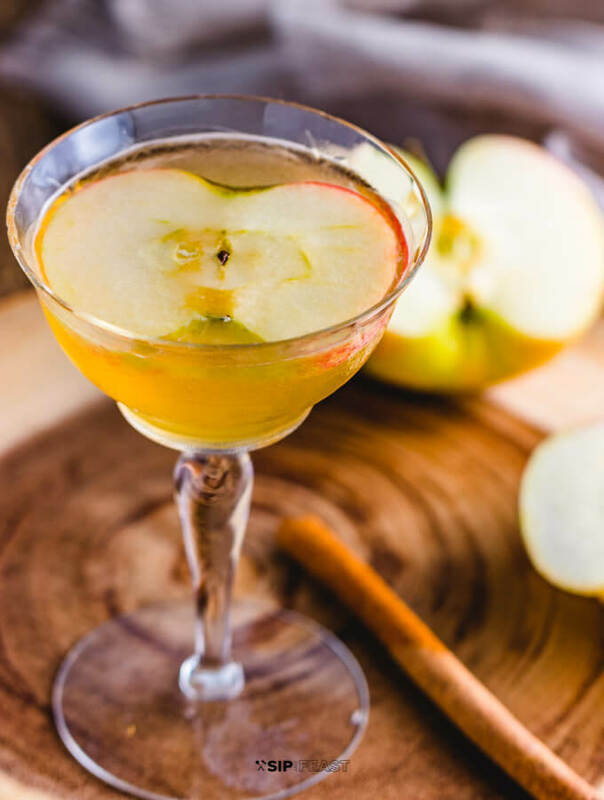 Any apple cider will also do for this apple cider cocktail, but try and get fresh, cold pressed if possible. One of our favorite ciders is Red Jacket’s Fuji Apple cider. 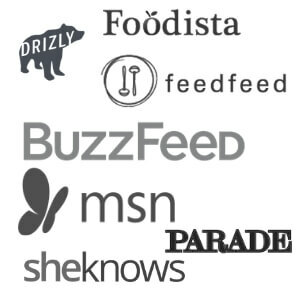 It’s made in NY, so it’s local to us and is minimally processed. You’ll also want to pick up some apples as well as a cinnamon stick or two. Any variety of apple will work nicely, but I tend to be partial to honeycrisps and fujis. Last, but certainly not least is the bourbon. We used Maker’s Mark because it’s reasonably priced and is great for mixing in cocktails. You’ll also need a cocktail shaker, measuring spoon, and a cocktail jigger or measuring cup. I served this in a coupe glass but it could also be served in a rocks glass or even a martini glass. Fill your cocktail shaker with ice. 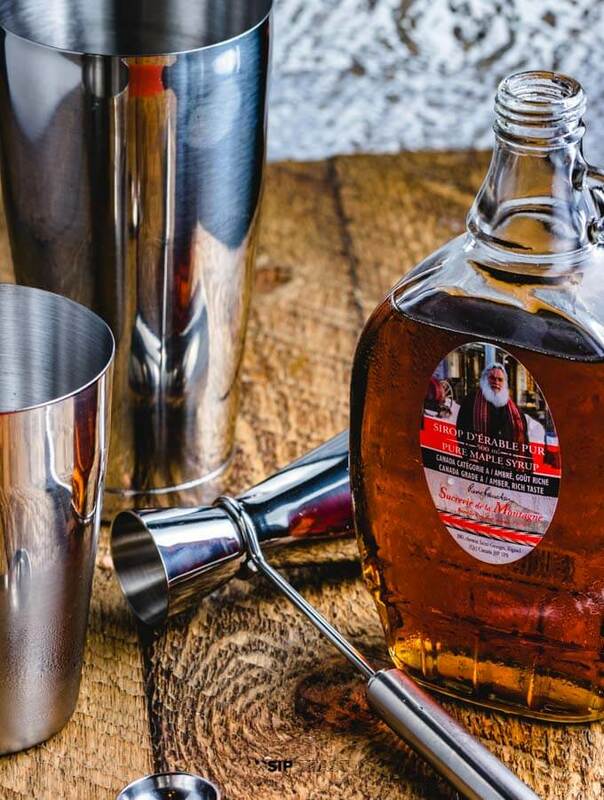 Add the maple syrup, apple cider and bourbon to the cocktail shaker. 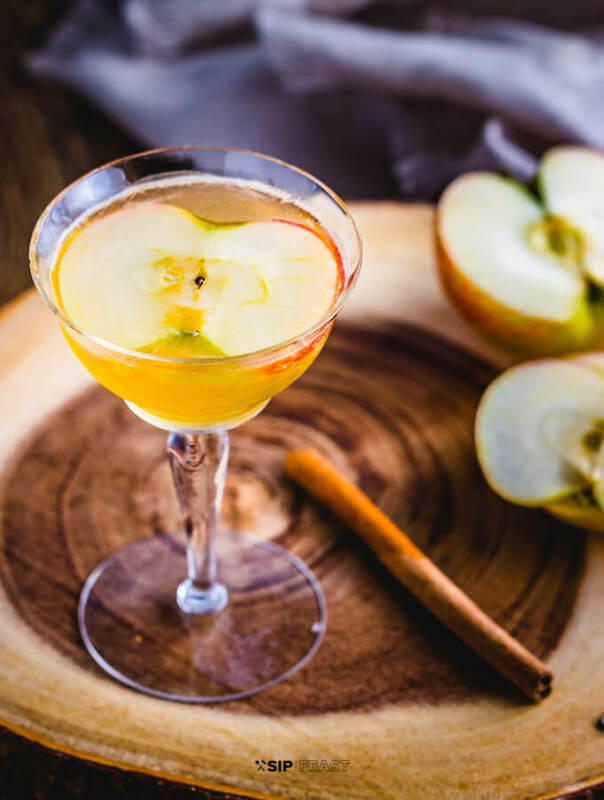 Slice some apples and add the cinnamon stick to the serving glass. Shake the ingredients in the cocktail shaker vigorously for about 20 seconds. Strain and pour into the cocktail glass. 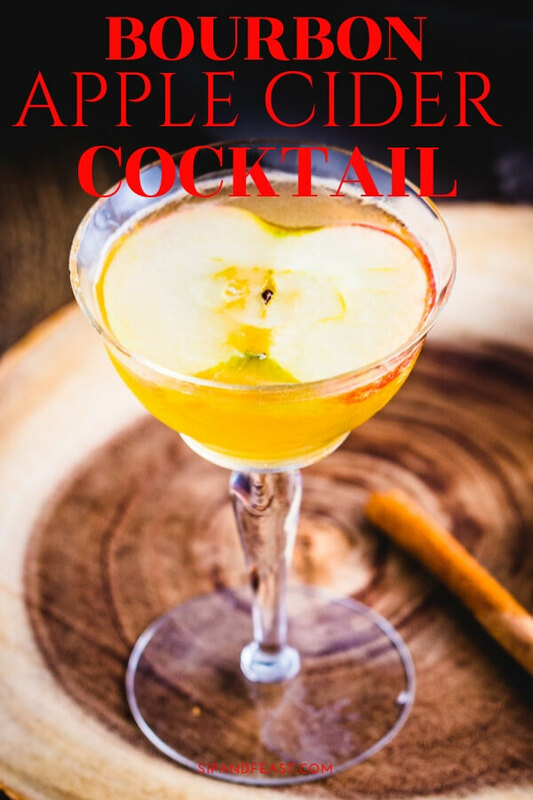 Using the cinnamon stick, gently stir the drink to further infuse with cinnamon flavor. Add the apple slice for garnish. 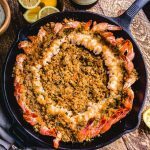 Serve with or without the cinnamon stick. Enjoy! 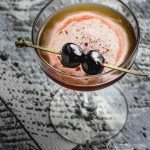 If you love bourbon try our Perfect Manhattan Recipe or if you’re looking for another Fall cocktail check out our White Wine Sangria. 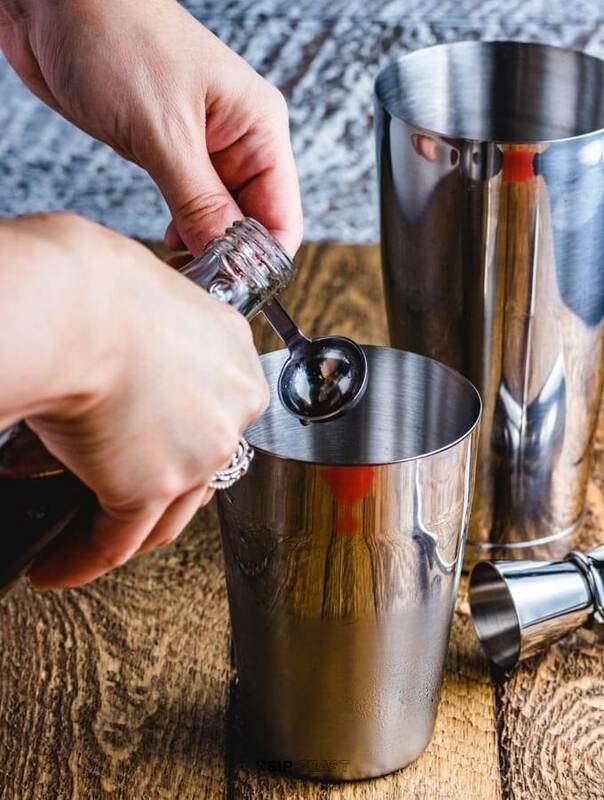 Add the maple syrup, bourbon and apple cider to the cocktail shaker. 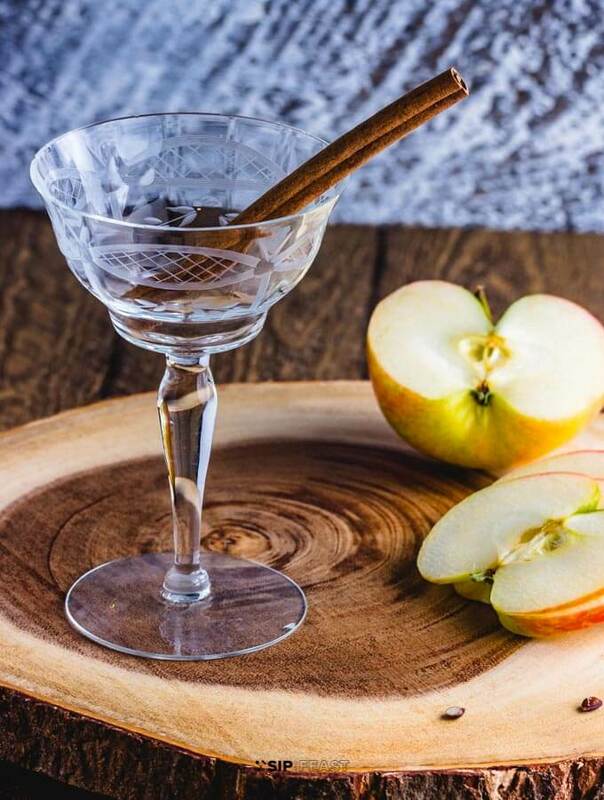 Share this bourbon apple cider cocktail on Instagram or Facebook with #sipandfeast to let us know how you did! 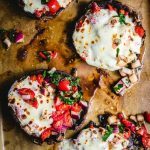 Follow us on Instagram, Pinterest and Facebook and sign up to receive great recipes delivered directly to your inbox.